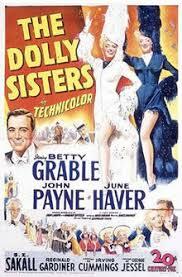 The marquee movie airing at 8 pm Eastern/7 pm Central is The Dolly Sisters, the 1945 pseudo-bio-pic from 20th Century Fox, starring Betty Grable and June Haver as a highly fictionalized version of Jenny and Rosie Dolly, Hungarian-American twin sisters who were major stars in the U.S. and Europe in the early 20th century. John Payne plays Harry Fox, Jenny Dolly's dancer husband, but it's S.Z. "Cuddles" Sakall who steals the show every time he appears as the adorable but irresponsible Uncle Latsie. Standards that qualify for the Great American Songbook like "Carolina in the Morning" and "I'm Always Chasing Rainbows" are performed in the movie. 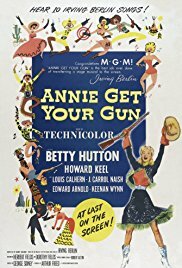 After the Dolly Sisters take a bow, Miss Annie Oakley is up in Annie Get Your Gun, the big, boffo 1950 Hollywood version of Irving Berlin's stage musical. With "more bounce per ounce" Betty Hutton as Annie instead of Broadway's Ethel Merman, this technicolor extravaganza definitely has energy to burn. Howard Keel is handsome and tuneful as Annie's husband and shooting rival, Frank Butler, and Berlin's dandy score, stuffed with hits like "There's No Business Like Show Business," "You Can't Get a Man with a Gun" and "Anything You Can Do" can't be beat. Annie Get Your Gun airs at 9:15 pm Central time tonight on TCM. 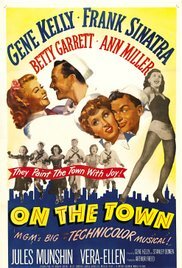 The Bronx is up and the Battery's down when Gene Kelly, Frank Sinatra and Jules Munshin dance all over Manhattan in On the Town, the 1949 film musical based on the Broadway show with music by Leonard Bernstein and book and lyrics by Betty Comden and Adolph Green. Kelly, Sinatra and Munshin play sailors looking for fun and romance during their 24 hours of leave, with Vera-Ellen, Betty Garrett and Ann Miller providing the romance part. "New York, New York" is the song you'll know from this one, which begins tonight at 11:15 pm Central time. The Band Wagon, often listed as one of the best movies ever made about theater, follows at 1 am Central time. Fred Astaire plays Tony Hunter, a star with his best years behind him, cast in a new Broadway show with a much younger, more serious leading lady, played by Cyd Charisse, with Jack Buchanan as an artiste of a director who plagues them with strange ideas. Nanette Fabray and Oscar Levant are Lily and Les Marton, stand-ins for Comden and Green, who got story credit for the film. The soundtrack is first-class, with gems from Arthur Schwartz and Howard Dietz like "That's Entertainment," "A Shine on Your Shoes" and "I Guess I'll Have to Change My Plan." 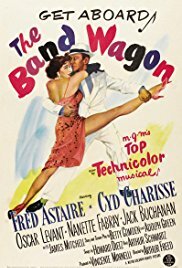 This 1953 Band Wagon, directed by Vincente Minnelli, took its name from a 1931 Broadway revue with a Dietz/Schwartz score that starred Fred and Adele Astaire. Other than borrowing a few songs like "New Sun in the Sky," "I Love Louisa" and "Dancing in the Dark," the film Band Wagon is a new cinematic creation. 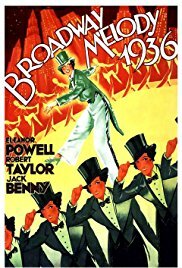 After a short called MGM Jubilee Overture, TCM's Great American Songbook ends in the wee hours of morning with Broadway Melody of 1936, scheduled to begin at 3:30 am Central time. The plot is convoluted, circling around Eleanor Powell as a dancer who wants to be in Robert Taylor's new show, but they were sweethearts in the past and he doesn't want her anywhere near Broadway, so she falls in with a crazy scheme concocted by meanie show biz columnist Jack Benny but hijacked by Taylor's snappy secretary Una Merkel, who likes Powell. To get her chance, Powell pretends to be a made-up French star visiting New York, complete with terrible accent. It's all pretty crazy, but it's backed up by music like "You Are My Lucky Star," "I've Got a Feelin' You're Foolin'" and "Broadway Rhythm," as performed by the likes of Buddy and Vilma Ebsen, Frances Langford, June Knight and, of course, Eleanor Powell.